Kaliningrad is a city, or Russian exclave, to be exact, with unique history and location. 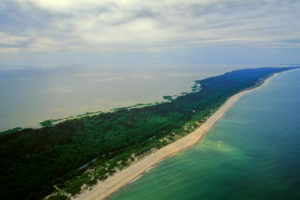 It’s situated between Poland and Lithuania, right next to the cold Baltic Sea, and is a very important Russian seaport. Kaliningrad used to be known as a German city Königsberg (1255-1946). That is why you should not be surprised when you see some German architecture in the city. Moreover, this city served as a home to such famous people as philosopher Immanuel Kant, writer E.T.A. Hoffmann and composer Richard Wagner. Kaliningrad is not a big city, its population amounts to 500,000 people, but it’s absolutely beautiful with it’s pine trees, beaches and sand dunes. The views are marvelous, and you might just get carried away, and spend all day at the beach admiring the sunset. In addition, you might feel like you’re somewhere in Europe because of the German architecture. least half a day to see all the things it has to offer. As you might have guessed, the name directly relates to the famous German philosopher Immanuel Kant. He used to spend many of his days at this spot, hence the name. The philosopher did not only spend his days there, but also wrote his well-know Critique of Pure Reason where he argued about God’s existence. Kant actually lived in Königsberg all his life, and died there when he was 80. 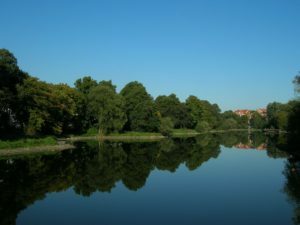 On Kant’s island, you will be able to visit his museum, his tomb and his monument, and the highlight – the Königsberg Cathedral. Also, don’t forget to visit the place where he was a rector -Imannuel Kant Federal University of the Baltic (Albertina University in the past) in Kaliningrad itself. Admire the Königsberg Cathedral. 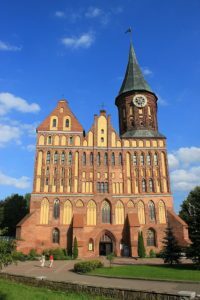 It’s a must-see cathedral in Kaliningrad wich is located on the Kant’s island. It’s a brick Gothic style cathedral, built in the 14th century. It was almost completely destroyed during WWII, but since 1990 huge reconstruction works had started. It was finally revealed in 2005. There’s a museum on site where you can find out more about the history of the cathedral. Baltic Sea is the best place to get amber, so you’ll find many wonderful amber jewelries being sold everywhere. So, why not start by visiting the Amber Museum, and seeing some amazing amber collections that you’ll never see anywhere else. You can also learn about amber origins, the process of making amber jewelry, extracting amber, and the many properties that amber has. And, don’t forget to get an amber souvenir for your friends and relatives. Spend time at the Curonian Spit. It’s basically a 98 km sand-dune spit that separates the Baltic Sea from the Curonian Lagoon. Part of it lies in Russia, and part of it belongs to Lithuania. Curonian Spit is a wonderful place that is definitely worth your time. You can get a nice tan there, or hide from the sun under the trees and have a picnic. Besides, it’s an official UNSECO World Heritage Site, and who would want to miss that? Visit the Fishing Village. It’s located on the River Pregel, and is a great place to visit. It’s a recreation of a fishing village that used to exit there before the war. Now, it’s a quaint little place with German-style architecture, hotels, cafes, shops and restaurants. The heart of the village is 31-meter high lighthouse. You can climb all the way up, and enjoy the lovely views of the city and Kant Island. Try delicious local food. In Kaliningrad, you have an opportunity to try not only Russian cuisine, but also European – especially Lithuanian. For Lithuanian cuisine we recommend to try Brikas. You might be interested to taste zeppelins (potato dumplings), Lithuanian cold borsch, and kepta duona (fried rye bread with cheese and garlic). If you feel like some Czech food, go to a traditional tavern, called U Gasheka. Czech beer and snacks are served in abundance there, accompanied by some live music. For some authentic German sausages and Weiss Bier we encourage you to visit Tetka Fisher restaurant. There are many other restaurants that you might discover on your journey through Kaliningrad. If you like variety and adventurous in your taste – try as many as you can. The best way to learn about the history of Kaliningrad is to go through its famous sights and, of course, museums. Take a walk through the Museum of World Ocean, and admire the beautiful ships. And if you are there, don’t miss out on getting inside of a real submarine at B-413 Submarine Museum. Visit the Friedland Gate Museum. It’s a fortress town which is impressive on the outside, particularly the gate itself, but it’s also very interesting on the inside. It’s one of the best places to see what Königsberg used to look like, and learn about its history. 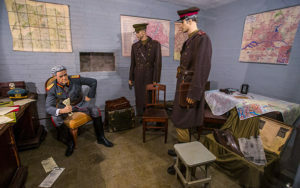 If you’re not afraid of small places and don’t suffer from claustrophobia, you can also check out the Bunker Museum. It’s literally an underground bunker, located in the centre of Kaliningrad. If you love history, then it’s a must visit for you. 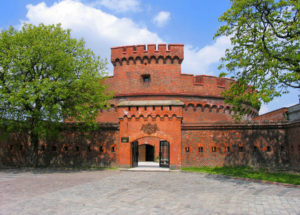 You can also admire the many forts that Kaliningrad has. All of them played major roles during WWII. It’s best to take a city tour, if you want to see them all in one day. They all are spread pretty far away from each other. 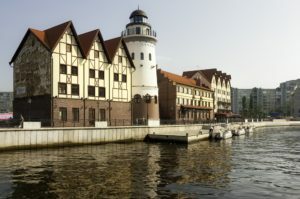 Kaliningrad is a city surrounded by the Baltic Sea, many lakes, rivers and ponds. So, wherever you go, you’ll find water. One of the lakes that is worth seeing is Verkneye Lake. You might spot some seagulls and swans there together with some local fishermen. You can feed the swans, and enjoy a nice peaceful walk or even a picnic by the lake. 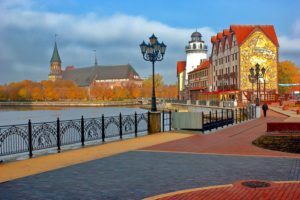 There are many other wonderful things and activities that Kaliningrad has to offer, so don’t be afraid to just walk around the city. You might be surprised by what you can find. Kaliningrad will be hosting 4 Soccer World Cup matches in 2018, so there is another reason to visit that interesting city. For more information on match schedule, check here.